There are a few less than scientific bio / neuro feedback techniques out there. Consider any claims very carefully. Do you really believe that it is possible to determine liver / kidney function by measuring skin resistivity? If it was possible why are such devices not used in hospitals as a diagnostic tool? Heart rate / heart rate variability is scientific and a very good indicator of levels of relaxation. (See research note below). 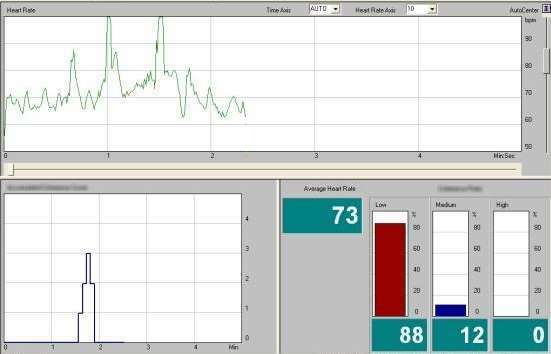 Heart-rate based biofeedback techniques are used in some sessions to provide a tangible / visible indicator of change over time. The technique is also very effective when demonstrating that patients do have a substantial level of control over feelings eg when they use the relaxation / control techniques that are taught as a matter of routine. 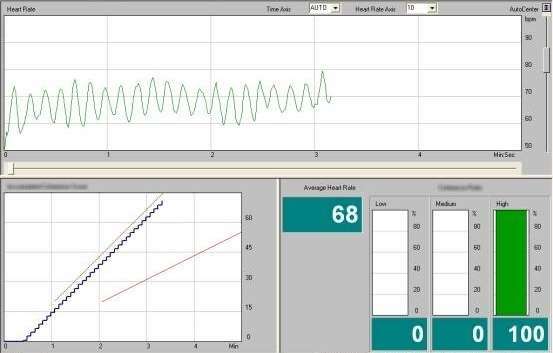 The technique can be used "blind" without immediate visual feedback to the patient (eg when taking a baseline / progress reading) or in feedback mode. There are a variety of feedback modes whereby the patient is put in control of what happens on the screen - eg "the more you relax the higher a hot air balloon rises into the sky and travels across a virtual landscape". The example below shows the profile of a patient with a long standing anxiety based condition prior to the commencement of therapy. The heart rate range (min - max) is wide and the average resting heart rate is higher than expected given age / level of fitness etc. The next example is taken at the end of the second therapy session with the same patient following a combination of hypnotherapy / timeline therapy and EMDR. The heart rate range has stabilised and the level of variation over time has normalised, the average resting heart rate has also normalised. On request biofeedback can be used as a primary treatment intervention for some stress / anxiety based conditions as well as some cardiac / blood pressure conditions. In 1985 The Sunday Times commissioned a study by Professor Cary Cooper about stress in the workplace. In 1997 the paper commissioned a further study and it quickly became apparent that almost every job in Britain had become more stressful than it had been just over a decade previously. The work involved in the evaluation is treated for costing purposes as a single extended session inclusive of report writing etc. DeBenedittis, G., Cigada, M., Bianchi, A., Signorini, M. G. and Cerutti, S. Autonomic changes during hypnosis: a heart rate variability power spectrum analysis as a marker of sympatho-vagal balance. International Journal of Clinical and Experimental Hypnosis. 2(2). 140-152. Preliminary results indicated that hypnosis affects heart rate variability, shifting the balance of the sympatho-vagal interaction toward an enhanced parasympathetic activity, concomitant with a reduction of the sympathetic tone. A positive correlation between hypnotic susceptibility and autonomic responsiveness during hypnosis was also found.